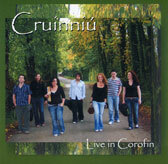 This excellent ensemble of young musicians, originally gathered from various parts of Ireland to participate in the 2005 Lorient Celtic festival in Brittany, was recorded live during the 2006 Corofin Traditional Festival in Co. Clare. The material is well chosen and well arranged, with plenty of opportunities for the various members to be heard individually and in various combinations. Siobhan O'Donnell, daughter of the famous Sligo flute player and singer Colm O'Donnell, is in fine voice, although one wishes she might have chosen somewhat less well-worn material. This is exciting, fresh, vital music. We should hear more from Cruinniu in the future.